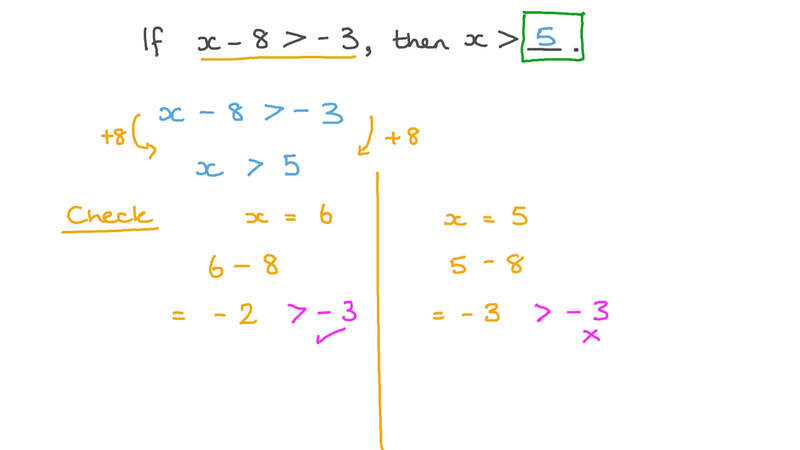 In this lesson, we will learn how to solve linear inequalities by applying inverse operations. If 𝑥 − 8 > − 3 , then 𝑥 > . Which one of the following numbers satisfies the inequality 𝑥 > − 6 ? Which of the following does not satisfy the inequality 𝑥 ≤ − 1 ? Which of the following inequalities is equivalent to 5 𝑥 < − 4 ? Which of the following inequalities is equivalent to 4 𝑥 ≥ 5 ? Solve the following inequality: − 1 0 𝑥 ≥ 6 0 . Which of the following inequalities has a solution of 𝑝 > 3 0 ? Which of the following inequalities has a solution that involves reversing its sign? Which one of the following numbers satisfies the inequality 𝑥 − 5 > 1 ? Which one of the following numbers satisfies the inequality 𝑥 > − 1 ? Which of the following does not satisfy the inequality 𝑥 ≤ − 8 ? Which of the following inequalities is equivalent to − 3 𝑥 < 4 ?